Formed in 1997, The Rockin’ Soul Horns quickly became a fan favorite on the Southern New England music scene. Spearheaded by Baritone Sax player Bob Hassan, musicians from top area bands were selected to form an on-going project of creating fresh new arrangements, playing classic arrangements and original music that grooves. Fronted by the smooth and energetic vocal style of Chantal Ambroise and highlighted by four horns, this eight piece band has put the groove in to a variety of venues. 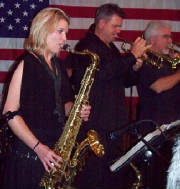 The Rockin’ Soul Horns were selected to play Rhode Island Magazine’s Best of Rhode Island Celebration 2005 and 2007. The band has performed at numerous weddings, corporate functions, night clubs, festivals and good old fashioned bar rooms through out New England. This includes Foxwoods, The Hi Hat, The Spring House on Block Island, Lord Thompson Manner in CT, Linden Place, 39 West, 1149 Restaurant Bovi’s, the Narragansett Café, and many more. THE ROCKIN’ SOUL HORNS’ influences range from the sounds of Frank Sinatra, the Big Bands of the 1940’s to the Soul and Disco sounds of the 1970’s and ‘80’s. Their dance sets include the 60’s soul of Aretha Franklin, to the 70’s sound of Stevie Wonder and KC and the Sunshine Band. Don’t forget today’s sound of Alicia Keys and Beyonce. The sounds of this eight piece group makes it hard not to move your feet!